Take part in hiking the mighty Mount Kilimanjaro when you visit Tanzania on this 5 Days Marangu Route Kilimanjaro Hiking safari. Contact us to take part in this adventurous Tanzania Safari. After breakfast at your hotel, you will check out and depart to Marangu Gate, about 4 hours’ drive from Arusha town, as a getaway point to the summit of Mount Kilimanjaro, and you will be accompanied by mountain guides and crews all the way. After the registration process at the gate you will start trekking toward Mandara Hut as the first where you will spend your overnight. The walk will take you about 3 to 4 hours and you will cover an altitude of 1900 meters up to 2720 meters. Along the way, you will have enough time to rest and have lunch before continue with the trek while learning about the mountain history, vegetation’s and different species of wildlife found at the park such as birds and animals. After an early breakfast, you will depart from Mandara Hut and trek all the way to Horombo Hut where you will spend your second night on the Mountain. A total of 11 km will be covered during the day that will take approximately six hours with an altitude rise up to 3720 meters. Along the way you will enjoy beautiful scenery of mountain that include different landscape such as a clear view of the snowcapped peak of Kibo and Mawenzi peak, forest and animals which together they will make unforgettable experience and life time memories to cherish. During the trek you will have time to break for lunch and learn about different and fascinating plant species found along the way such giant groundsels, lobellas and many more. Late in the afternoon you will arrive at the camp in time for your dinner, relaxation and overnight. On this day, right after breakfast the group will be trekking to the Kibo Hut (4,700 m). The actual trekking is not very difficult; just remember to stick with an appropriate pace to keep up your strength for the trekking to Kilimanjaro’s summit. When you reach the camp you will be served lunch, after which we recommend you sleep as much as you can, avoid any strenuous activity, and drink lots of water. Night departure from Kibo Hut (4,700 m), and the start trekking to Kilimanjaro’s summit Uhuru Peak (5,895 m). The trekking will be moderate from a physical standpoint, but the altitude presents a much more serious problem. For the entire length of the trekking each pair of climbers will be accompanied by their own guide, who will be monitoring your stamina and mental resolve. 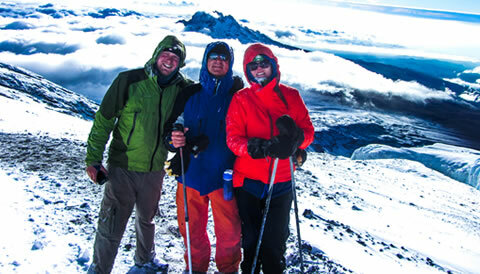 After your successful ascent to Uhuru Peak, you can descend to the nearest glacier if desired. Then you will return to Kibo Camp and after a two-hour rest continue your descent to Horombo Hut (3,720 m). End of the 5 Days Marangu Route Kilimanjaro Hiking Safari.